Hello everyone. First off I want to thank Michael for giving this fanboy a chance to do a figure review for his site. Much appreciated. My foray into 1/6 world was like many of yours, G.I. Joe back in the 70’s, and I have been stuck ever since. 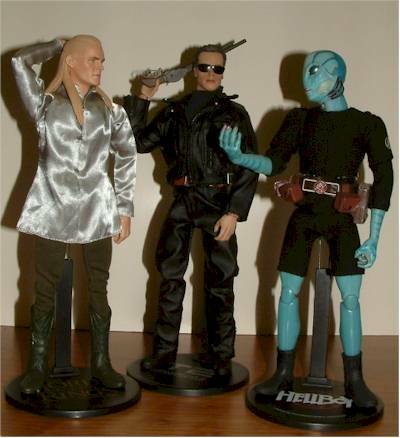 I was mainly a military figure collector but then started getting into the Star Wars figures when Kenner did the 12 inch figures in the 90’s, based on the new Joe body. The 12-inch figures have had quite a Renaissance since then, with Dragon, Hot Toy and Sideshow really pushing the envelope of what is possible. I love the Sideshow Star Wars line, despite its very minor shortcomings. 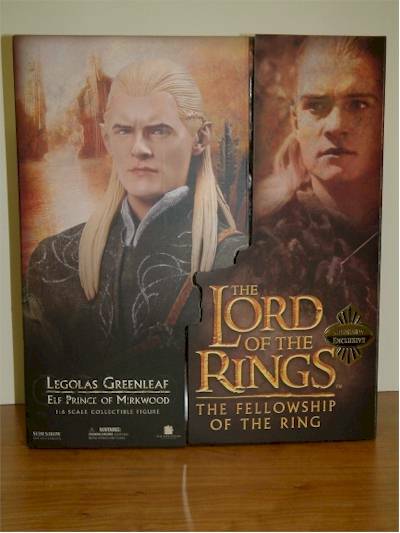 Legolas is my first Lord of the Rings figure period, and my wife’s favorite LOTR character, so he’s got a lot to live up to. But I am confident. 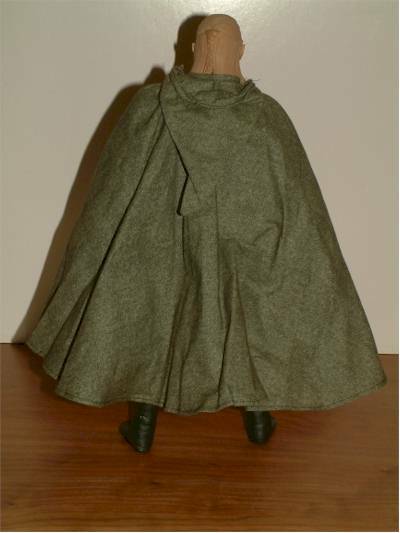 I purchased the Exclusive version of the figure that comes with the Elven cloak. Spoiled I am by the magnetic closures of the Star Wars figures. The SW boxes work so well, I am surprised Sideshow doesn’t use them on all of their figures. The Velcro closures do the job and the box makes a very nice triptych type display when opened. And the package is very collector friendly with no twisties and well-planned trays that hold everything in place just great. The box art is also done in a satin finish that really adds to the richness. Andy Bergholtz was one of Sideshows best sculptors and does fantastic work. However, The likeness to Orlando Bloom is off considerably. Orlando is much more boyish and his features are softer. 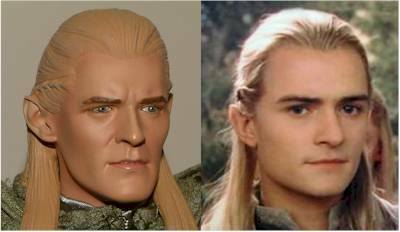 The sculpture is more rugged and manly and could be Legolas when he has aged many more years. The expression is serious and stern, which works well since a neutral expression could have come off very wrong for this character. The chin is a bit Leno-esque. 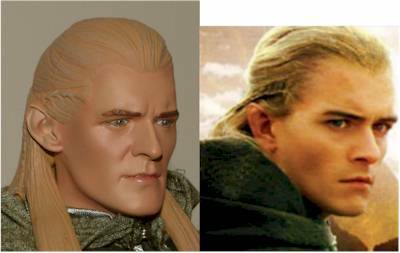 The hair has a minimum amount of texture, which works well as Legolas’ hair was very fine and smooth. The long bits of hair are molded in a softer vinyl so as not to interfere with articulation. 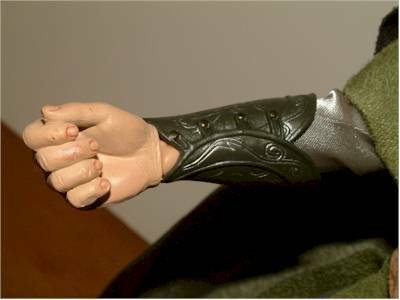 The hands do appear way too big if you take off his gauntlets and tunics and he is just wearing the satin shirt. The bane of 1/6, they don’t look right nekkid. You do not notice the hand size at all with the clothing on. The paint applications are done very, very well, as I expect from Sideshow. No slop or runs. My personal figure has a touch too much shadow color on the left side of his face, but it is really hard to notice. Just my artsy background, I pick up on stuff like that. The eyes have the nice gloss coverage on them, as does the innermost line of the mouth. Again, too much gloss on his lips and it would come off wrong. Sideshow used just the right amount. The hands are well painted as well with a semi-gloss coat on the nails. Standard sideshow body articulation. The very nice and mobile ball joint in the neck is sometime limited by the Elven cloak, depending on the pose, but that is a small nitpick. I really love this costume. The use of all the different materials is well thought out and executed. The suede tunic is not too thick to be way off scale and all the fabrics hang well and don’t interfere with pose ability. 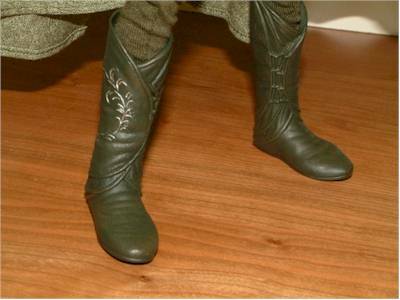 My only nitpick is on the boots. Since they are 1 piece cast vinyl they lack the depth and dimension the rest of the outfit has. 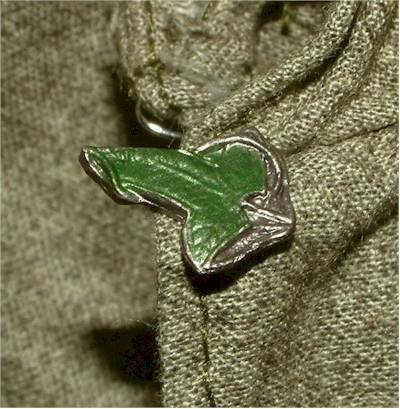 The Elven cloak sports a wire in the hood for posing and the fellowship leaf broach by the clasp. 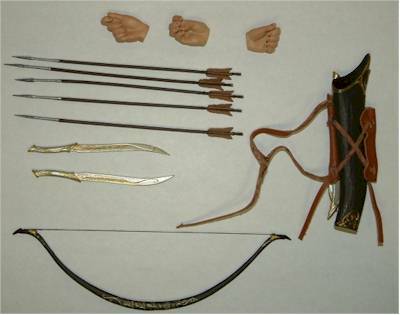 The weapons are done very well and highly detailed and accurate. The bow actually pulls back and the arrows have nocks in them. The quiver is thin plastic that looks and feels almost like bone. It is tied with leather strapping and has painted gold detailing. The knives are also well done and film accurate with intricate gold and silver detailing. As Michael has said a few times in his reviews, these figures are a little costly for kids to play with, but that does not detract from the fun an adult can have! 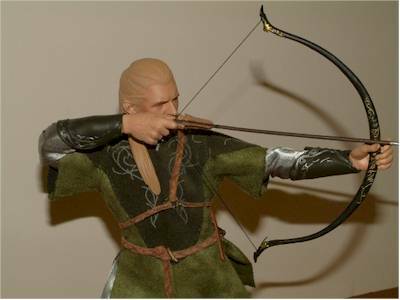 Like many other figures, Legolas is great for displaying in various poses and also for the ever-popular photostory shoots. As far as I am concerned, Sideshow delivers a solid value for what you get; a very nice high quality collectable figure. The level of details and use of multi-media materials all go far to make the purchase worthwhile. 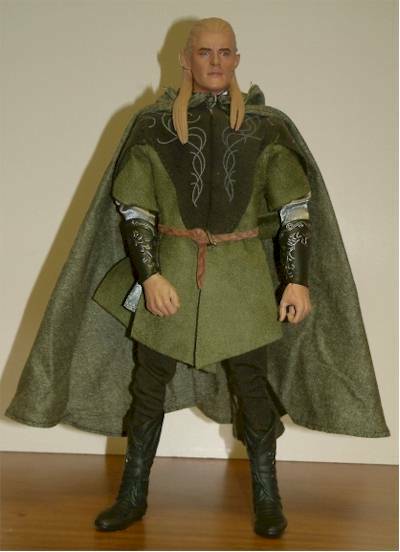 Legolas certainly has enough accessories and costuming to make him worth his $64.99 price tag. On the exclusive version, the Elven cloak can be a little difficult to clasp and I worry about damaging the broach. I have to throw out my minor nitpicks when judging overall, because when you look at the figure in a whole, it is very impressive. Even though the likeness is not 100% there, you know immediately who it is, and it transport’s your mind’s eye back to the theatre, watching Lord of the Rings and living it’s magic. And that is what collectables are for. - Sideshow still has regular Boromir ( ) and the regular Legolas ( ) available, or you can get on the wait list for the exclusives. 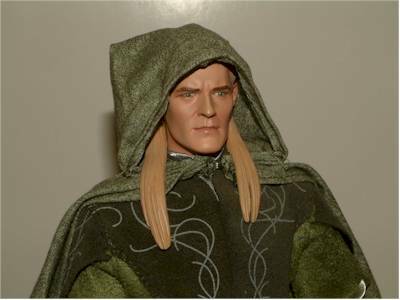 - CornerStoreComics has Legolas at $46.74, which is a steal for this figure. - Amazing Toyz matches that terrific price of $46.74! - and not to be outdone, Alter Ego Comics also has him at $46.74. - at only a penny more, you can pick him up for $46.75 at Fireside Collectibles. - Dark Shadow Collectibles also has him at $46.75, in stock. - Dark Figures has him for just $49.99. - and for those of you in the U.K., Forbidden Planet has him on sale at 35 pounds. Figure from the collection of Don Bledsoe.